These student houses stand out for more than their overly big dinner tables. 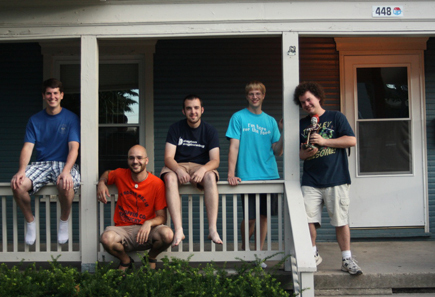 The Office for Mission and Rector, with cooperation from Campus Ministry, provides a unique housing opportunity for students interested in exploring the Marianist tradition, and who are committed to building and living in community in the student neighborhood. These communities use Mary as their model to form homes of Marianist hospitality. Inspired by the Marianist Charism of bringing the Gospel message of Jesus to our world, students commit to live together and be a witness of Christian community to the students in the student neighborhood. The communities strive to incorporate the Marianist Charism and the Commitment to Community into their everyday lives. 1515 Frericks Way 229 Kiefaber St.
1903 Trinity Ave. 305 Kiefaber St.
234 Stonemill Rd. 435 Kiefaber St.
340 Stonemill Rd. 57 Woodland Ave. The application process will start in November 2018 for the 2019-2020 school year. Find information about the application process, the timeline, and the application.